Steelcase cubicles are expertly designed to be adaptable to your evolving company. The multifunctional capabilities of these cubicles have earned Steelcase international renown for cutting-edge design and craftsmanship. Easily reconfigurable, they can be modified to accommodate changes in your personnel, shifts in office décor, and new philosophies in workforce efficiency. Panel Systems Unlimited offers a wide selection of used Steelcase cubicles for Atlanta offices and workplaces in cities across the country. Our Steelcase workstations, like all of our used options, are hand selected to ensure they meet our strict standards for exceptional appearance and structural integrity. We never sell dingy, chipped, or stained used cubicles. We start with a superior product and then apply any touchups or replacement pieces needed to get it looking like new. Panel Systems Unlimited is a full-service office cubicle wholesaler and dealer, and we also provide design and installation services when you buy used Steelcase cubicles from our selection. Our space planning experts use CAD technology to produce detailed floor plans of your specific workplace. 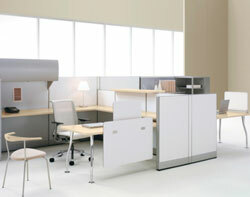 We then configure your Steelcase workstations in a way that maximizes workflow and efficiency. With this plan, we install your cubicles and take care of every aspect, from assembly to electrical connections. For the most comprehensive wholesale systems furniture selection and professional services, the choice is clear – Panel Systems Unlimited. Contact us today for more information on our selection of Steelcase cubicles, computer workstations, and other used office furniture for businesses in Knoxville, Atlanta,Orlando, Washington, D.C., Lexington, Durham, and beyond. Be sure to ask about our furniture liquidation services as well.